Fun with number puzzles! For sharp students these puzzles are created to widen the mental horizon of the sharp students. 2. Recognize the pattern and find the missing numbers in the small squares. 3. Work out the pattern and complete the drawing. 4. Look at the circle pattern below. 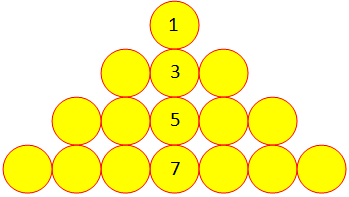 The first row contains one circle, the second row contains three circles, the third row contains five circles, the fourth row contains seven circles and so on.